A former preschool teacher, Amy Ramnarine is now a full-time mom and crafter. When she isn’t running after her daughter, she runs a blog and Etsy shop called The Stitchin’ Mommy where she shares recipes and sells her patterns. 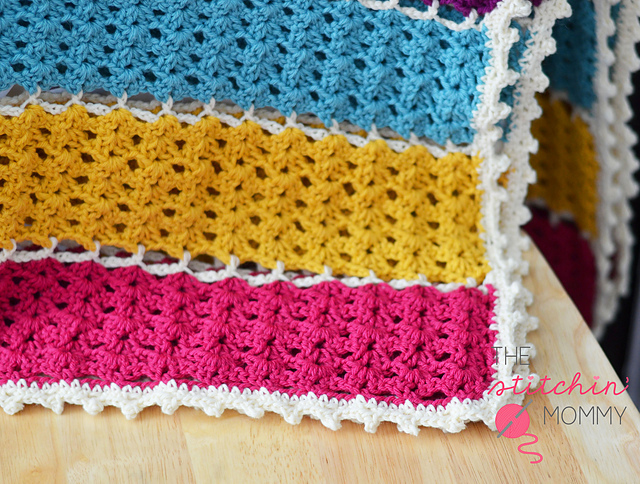 Amy’s most recent design, Jeweled Lattice Afghan, was crocheted as a gift for a good friend’s newborn daughter. She shared the free pattern on Ravelry as a gift to all of us! The colorful design alternates between five jewel tone shades of our Vintage yarn, with a sixth neutral shade used as a border. The finished blanket is 48 inches wide and tall. I bought some of the yarn when there was a sale and I just fell in love with the colors. The yarn sat in my stash for a couple of months. I wanted to make something really special with it since it is so beautiful, so I decided to turn it into this beautiful afghan. I feel like the last pattern I work on always ends up being my favorite. This afghan is definitely my favorite at the moment. I love it because the colors are bright and the pattern looks so intricate. When I was making this afghan, I ran out of yarn twice, and in the middle of a colored row. I ended up with two different dye lots of the Sakura (pink) yarn and didn’t know what to do since joining them would make the afghan look weird. That is why there is a stripe of pink in the middle and at the two ends. It’s a stress reliever for me. I enjoy curling up on the sofa with my hook in my hand and just letting the trials and tribulations of the day just melt away.